One of the hazards of becoming extremely wealthy is that you can be fooled into thinking that you are also extremely wise. Wealth is power, and power is dangerous, because people tend to go mad with it. Yet if you are surrounded all day by people who praise your genius and defer to your authority, you may have a hard time realizing when you have slipped into grandiosity and megalomania. One good way of checking is to ask yourself the following question: “Do the things I say sound like things a Bond villain might say?” If the answer is “yes,” you should probably rethink your life. Ray Dalio is one of the richest and most influential men in the world. He is the founder and chairman of Bridgewater Associates, the world’s largest hedge fund. Bridgewater is known in the financial industry for two things: its extremely high levels of investment success and its extremely unusual corporate culture. The company operates according to a strict set of rules promulgated by Dalio that aims to eliminate emotion and ego from corporate decision-making. 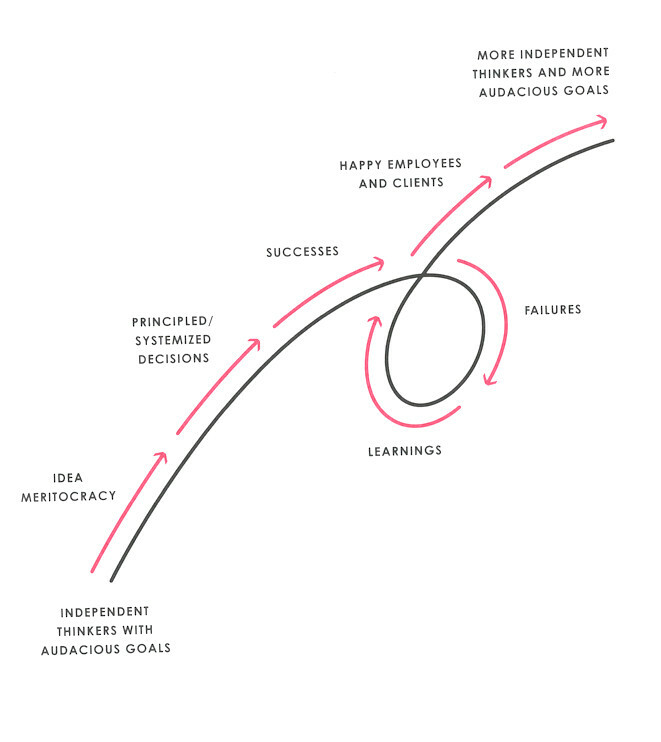 Dalio’s “principles,” of which there are well over 100, emphasize strict rationality, which Dalio believes necessitates radical honesty, transparency, and accountability. And by “radical,” I do mean radical. For Dalio, honesty means employees are encouraged to tell coworkers exactly what they think of them, even if it might be deeply hurtful. (“Pain + Reflection = Progress,” Dalio writes.) Transparency means that employees’ interactions and phone calls are taped and listened to by others in the company. And accountability means that employees are given intense scrutiny on their personal faults. Dalio even has employees use an app in which they rate each other constantly in real time, with the data compiled into individual profiles called “baseball cards” displaying the employees’ weaknesses and strengths as determined by their peers. Until recently, it was easy to simply laugh at Dalio and Bridgewater as an amusing reduction ad absurdum of Wall Street culture, a parable about what can happen if you take “efficiency maximization” too seriously. The hedge fund has its headquarters in the woods of Connecticut, and the employees don’t seem to leave much. The ones who stay at the company apparently thrive there (and get obscenely rich), and it’s difficult to have much sympathy for hedge fund managers, meaning that Dalio’s eccentric philosophy (half Tom Peters, half Chairman Mao) was, to me at least, a harmless curiosity, or at least no more harmful than any other hedge fund (so, quite harmful actually, just not uniquely so). Last year, however, Dalio has brought out his Principles as a book, and recorded a TED talk that has several million views. The book has been favorably reviewed in the New York Times, hit #1 on the bestsellers list, and carries blurbs from Mark Cuban, Arianna Huffington, Michael Bloomberg, Bill Gates, and Tony Robbins. Dalio is no longer merely running an experiment on a few hundred haggard 20-something Harvard graduates in the woods of Connecticut. Now he is encouraging other employers to follow his lead, meaning that if one of the world’s “most influential” men has his way, more workplaces would conform to his “radically transparent,” emotionless, cruel, totalitarian vision. I want to look a little deeper, then, at Dalio’s book, to display it in its full creepiness, and to ponder what can be said about a world that bestows disproportionate power and influence on men who think this way. 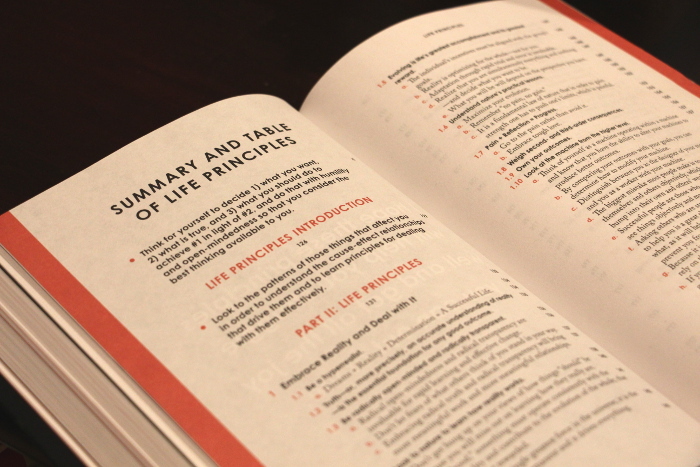 Principles is over 550 pages long, and is Part I of an expected two-volume set, the first of which focuses on “life and work” and the second of which will cover economics and investing. 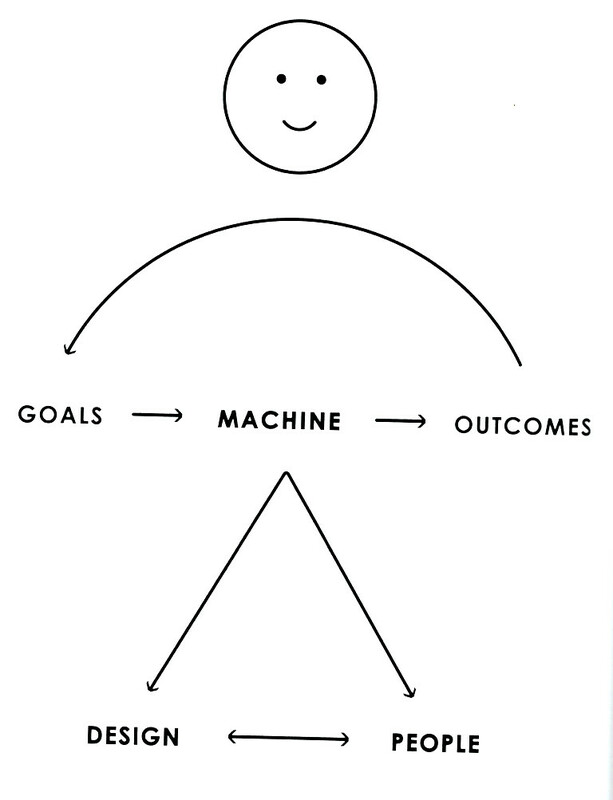 It lays out a comprehensive philosophy, first applying Dalio’s rationality to the pursuit of one’s life goals, and second applying them to the world of work. The “work” portion does not explicitly say that the assumed reader is a boss rather than a low-level worker, but it’s full of references to “the people you manage” and “building your organization” that make it clear Dalio is speaking more to aspiring startup founders than fry cooks and auto-plant workers. This one means “learn from your failures.” Remember with this type of thing: It’s not always that it’s meaningless (though it often is); it can also be an unnecessarily complicated way of stating the obvious. Or it can be half meaningless, half obvious. There are many variations. 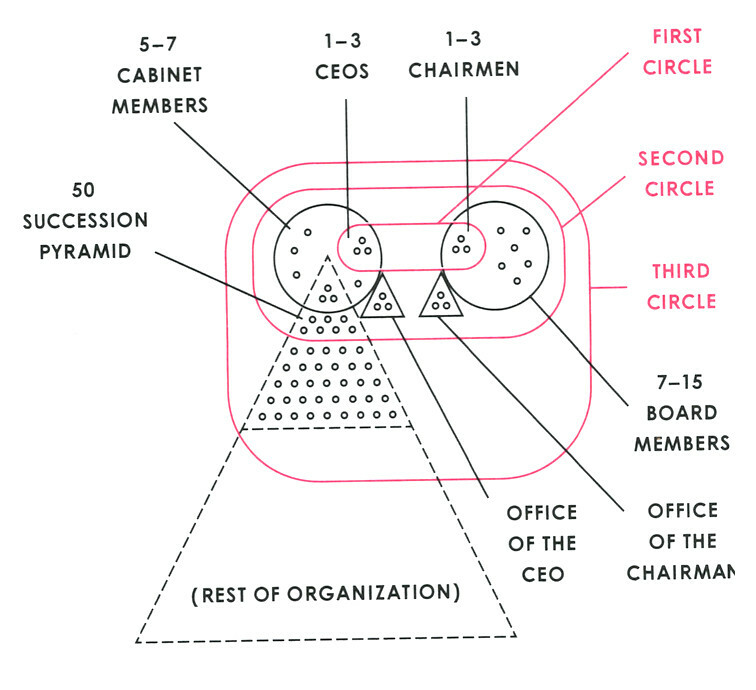 Ray Dalio shows you how to set up an organization. I’m planning to implement this at Current Affairs. I think it will really help us clearly understand who is responsible for what. It’s not quite Jordan Peterson’s diagrams. But, man oh man: This is the sort of thing the Masters of the Universe take for profundity, let’s get going with the populist uprising already. There’s also a fair amount of dubious pop psychology (“right brain”/“left brain” personalities, the Myers Briggs typology, Joseph Campbell’s hero schema, etc.) alonside categorical statements about the nature of life, the universe, and everything (e.g., “the primary purpose of every living thing is to act as a vessel for the DNA that evolves life through time,” which is not actually the primary purpose of every living thing unless you choose it to be). Some of this is helpful, if you don’t realize that failures should be treated as learning experiences and that a successful manager should hire good people. But this isn’t the stuff Dalio’s referring to when he says he likes to “imagine and build out new, practical concepts that never existed before,” and it isn’t the reason why the Principles have attained notoriety in the financial industry and beyond. In pursuit of my goal to give them strength, I will often deny them what they “want” because that will give them the opportunity to struggle… Watching people struggle and having others watch you struggle can elicit all kinds of ego-driven emotions such as sympathy, pity, embarrassment, anger, or defensiveness. You need to get over all that and stop seeing struggling as something negative. I didn’t provide dental insurance any more than I provided car insurance, because I felt that it was their own responsibility to protect their teeth… If they needed dental insurance, they could pay for it out of their own pocket. My main point is that I didn’t approach benefits in the impersonal, transactional way most companies do, but more like something I provided for my family. I was more generous with some things and expected people to take personal responsibility for others. … I had determined that I wanted my sons to have only enough to afford excellent healthcare, excellent education, and an initial boost to help their careers get started. My perspective was influenced by my own journey through life, which took me from having nothing to having a lot. That taught me to struggle well and made me strong. I wanted the same for the people I loved. So, when I had earned a lot of money, I felt I had plenty of money to give away to others… I studied how other families approach the question of how much to set aside for family and how much to give away at what pace. While our family still has not answered these questions definitely, I know that I personally will give more than half of my money to those beyond my family. Compliments are easy to give but they don’t help people stretch. Pointing out someone’s mistakes and weaknesses (so they learn what they need to deal with) is harder and less appreciated, but much more valuable in the long run. When I went to Africa a number of years ago, I saw a pack of hyenas take down a young wildebeest. My reaction was visceral. I felt empathy for the wildebeest and thought that what I had witnessed was horrible. But was that because it was horrible or was it because I am biased to believe it’s horrible when it is actually wonderful? That got me thinking. Would the world be a better or worse place if what I’d seen hadn’t occurred?… I could see that the world would be worse. I now realize that nature optimizes for the whole, not the individual, but most people judge good and bad based only on how it affects them. … Most people call something bad if it is bad for them or bad for those they empathize with, ignoring the greater good. Make sure people don’t confuse the right to complain, give advice, and openly debate with the right to make decisions… At Bridgewater, I have encountered some people, especially junior people, who mistakenly think they are entitled to argue about whatever they want and with whomever they please. I have even seen people band together to threaten the idea meritocracy, claiming that their right to do so comes from the principles. They misunderstand my principles and the boundaries within the organization… Crowds get emotional and seek to grab control. That must be prevented. While all individuals have the right to have their own opinion, they do not have the right to render verdicts. But even the “meritocracy” has its limits. While most decisions should be made by those who have the best ideas, there is an exception: if the Believable People ever propose anything that threatens the financial interests of the owners. The principles, with all their radical transparency, can also be suspended for people’s own good. As he says, “while all these principles exist for the well-being of the community, there may come times when adhering to them could threaten the community.” He gives the example of a time when press reports were painting “distorted and harmful pictures” of Bridgewater, and he was forced to declare “martial law.” This was necessary because the idea meritocracy was under existential threat. There will be people who put what they want above the idea meritocracy and threaten it. Consider those people to be enemies of the system and get rid of them…. Don’t share sensitive information with the organization’s enemies. Both inside and outside of any organization, there are some people who will intentionally cause the organization harm. If these enemies are within your organization, you need to call them out… If the enemies are outside your organization and will use the information to harm you, of course don’t share it. 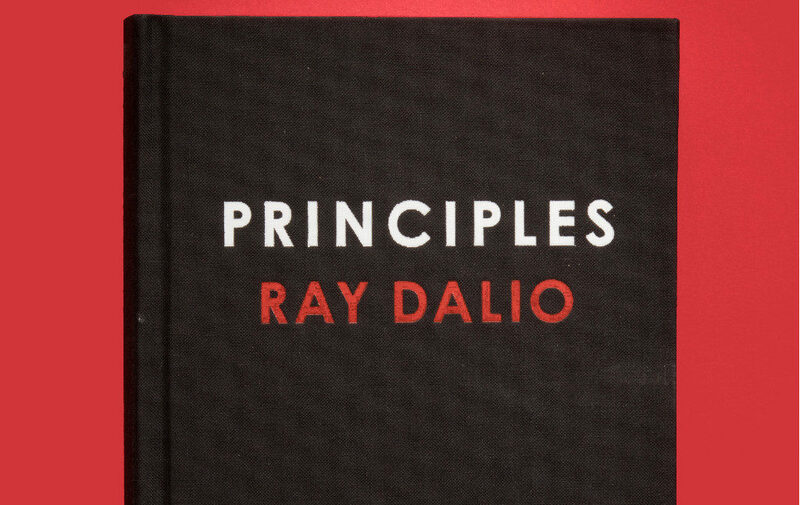 Ray Dalio’s Principles are, as I hope readers have realized by now, comically delusional. He doesn’t even contemplate the possibility of working with people’s feelings rather than trying to shame them out of having them. He states explicitly, over and over, that people are “machines.” But since he has to impose all of these rules through what even he describes as a “benevolent dictatorship,” a lot of people don’t seem to want to be treated as machines whose emotions are a coding error. He has to turn them into machines. In fact, Dalio knows this: When it has been pointed out that nearly 1/3 of Bridgewater employees leave the company within their first two years, the hedge fund’s defense has always been that only a very select few are a good fit for this sort of environment. Dalio has said that while a negative picture is painted by the disgruntled people who couldn’t handle the culture, those who stay thrive, because they “self-select.” But that means that, even on the assumption that Bridgewater employees love all the surveillance and struggle sessions, there’s no reason to believe these are good management principles for anyone except the tiny fraction of the population that wants to grow up to become an emotionally neutered finance drone. Does Bridgewater ever analyze whether its culture of constant self-examination and radical transparency is actually good for its investing? … [In Bridgewater’s self-descriptions] it’s never “our culture of constantly rating each other on iPad apps leads to better investment returns,” always “our culture of constantly rating each other on iPad apps leads to better ratings on the iPad apps.”… I am always left with the sense that the group therapy is the point, that the investor returns are a happy accident that subsidize all the introspection, and that Bridgewater is an odd little eddy in financial capitalism that uses investor money to fund the pursuit of personal enlightenment… I have joked before that Bridgewater’s business model is that it has a computer that does its investing, and that the computer uses the personal-rating games to distract the human employees so they don’t interfere with the investment process. If you spend all your meetings debating what the meetings should be about, then sure, you’re probably not going to have time to monkey with the investment algorithms. Indeed, in Principles, Dalio does spend a lot of time talking about the various apps he makes employees use, and the way those apps improve themselves over time (one of them, for instance, spits out the relevant Principle for any given situation you happen to find yourself in). But on the few occasions when he tries to actually prove that his system works, he says things like: “While the believability-weighted answer isn’t always the best answer, we have found that it is more likely to be right than either the boss’s answer or an equal-weighted referendum.” Look how evasive this is! “More likely to be right.” How much more likely? And okay, it’s better than just letting the boss decide or putting it to a majority vote. But that doesn’t actually provide real evidence for the complicated system of public dressing-downs and real-time performance ratings. It might just show that there are some people in the office that lots of people think are qualified, and those people are qualified, and when you give them a greater say, decisions are marginally better. 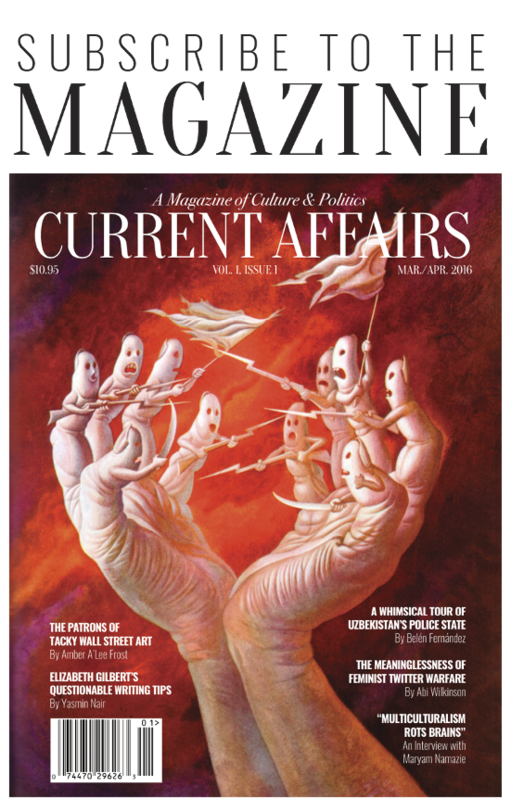 The question is: How would the system fare against one that didn’t have a culture of fear, but had some other way of deferring more heavily to people seen by their peers as experts? Every time you read about a discomfiting new management approach — getting rid of desks, continuous employee reviews, baseball cards – you should expect that it is coming to your own workplace in a year or two. Managers love experimenting with management, and the weirder a management approach is, the more it looks like management. “Just leave people alone and let them do their work, at their own desks” does not get you a Harvard Business School case study. “Make them hop on one leg while shouting self-criticism”: Now you are doing something. The success of Principles can tell us something about the 21st century economic elite. “Liberal” Hillary Clinton supporters like Arianna Huffington and Bill Gates are proudly endorsing a handbook for creating a invasive hierarchical dystopia. In a blurb, the New York Times called Principles “both instructive and surprisingly moving.” It’s certainly instructive. But what it should mostly teach us is that the top levels of the economy are inhabited by cruel, delusional, selfish people who have no problem treating underlings as experimental subjects. Principles should sit on leftists’ bookshelves next to Capital as a clear argument that those who have amassed an obscene portion of the world’s wealth do not deserve it and are morally dysfunctional. If it can teach us a single principle, it is that workers should respect people like Ray Dalio exactly as much as he respects them.